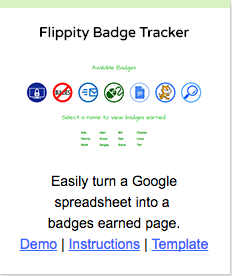 Flippity.net's badge tracker can come in handy when you need to see who in your class has already earned badges and who has not. Take a look at the 2 minute and 28 second embedded video below on how to use the site to keep track of badges. Keep up with those badges!